The April newsletter: CRMA Annual Conference, Ryan Dohrn book & webinars, CRMA Member News and a Free Offer plus timely articles. The March newsletter: CRMA’s Award finalists, new sales book & webinars. Financial Standards, Annual Meeting info, free webinars and timely articles. The February newsletter: CRMA’s new sales book, webinars & website area. Financial Standards, Annual Meeting info, free webinars and timely articles. 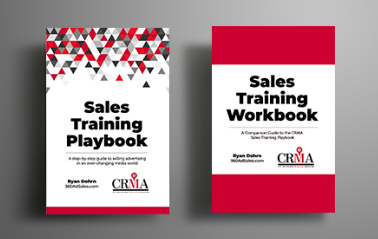 CRMA commissioned sales trainer Ryan Dohrn of BrainSwell Media to write a custom-branded sales training program. Learn more about the Sales Training Playbook and Workbook.